"Scythe", 2018, Oil and acrylic on canvas, 50h x 47w in. New paintings by Angelina Gualdoni. Asya Geisberg Gallery is pleased to present "Casa della Nuova Strega", the fourth solo exhibition of Angelina Gualdoni. An artist whose work vacillates between poured inchoate spaces and articulated objects, Gualdoni draws connections between textile dyeing, staining and mid-century color field painting, and continues to plow the fertile ground of still-life and interiors. By applying painted patterns by avante-garde female artists from the early twentieth century to the alternate side of the canvas, Gualdoni conjures ghostly afterimages as background, adding yet another layer to the lack of strict boundaries of time and space. These artists embody multi-disciplinary practices in theater, costume, and fashion along with traditionally fine-art pursuits and have become role models for a peripatetic and utterly contemporary multi-tasking life. From well-known artists such as Sonia Delaunay and Barbara Stepanova to more obscure Soviet and European forebears, Gualdoni forms a tenuous link to strategies of art production that now seem strikingly au courant, where textiles, design, and ornament are valued rather than dismissed as "merely" domestic, craft-based, or content-free. Always pushing her painterly choices by keenly observing art-historical strategies as well as lived and observed space, Gualdoni has mastered the painterly, spatial and metaphoric capacity of the pour and turned to staining from the anterior side of the canvas to add to the back and forth. A pattern painted darkly from the reverse seeps through as an alternately faint or visible echo, emanating mysteriously from seemingly nowhere - a witch's conjuring. Each painting holds our gaze with equal parts depictive power and compositional confusion - the rendered object focuses on a real tabletop or window, while the pour behind or on top does not announce its causality. Opacity and marks trump barely-there veils, while fragments of pattern come and go, defying a flattening power. Strega is Italian for witch, as well as a liqueur steeped in the forbidden allure of witchcraft. The "new witch" also implies a renegade feminism that has forced a historical renegotiation of "bad women" stereotypes. With a dearth of mythic and literary heroines, we are left to scour history and reframe powerful women who stood outside society. The new witch's house evokes the luminous magic of Gualdoni's painting, the odd objects remade as a witch's brew, the mundane recast as menacing eye of newt. Concoctions of paint and various thickening substances, the alchemy inherent in image-making, potions and spirits evanescing into raw canvas - the "Casa della Nuova Strega" lets Gualdoni's powers reign. Angelina Gualdoni received her BFA from the Maryland Institute College of Art, Baltimore, and her MFA from the University of Illinois, Chicago. Her paintings have been the subject of solo and group shows at the Queens Museum, NY, St. Louis Art Museum, MO, the Museum of Contemporary Art, Chicago, IL, The Aldrich Museum, Connecticut, the Museum de Paviljoens, Netherlands, the Neuberger Museum, Purchase, NY, and The Institute of Contemporary Art at Maine College of Art, ME. Her work resides in the Saatchi Collection, as well as the MCA, Chicago, and the Nerman Museum, Kansas City. 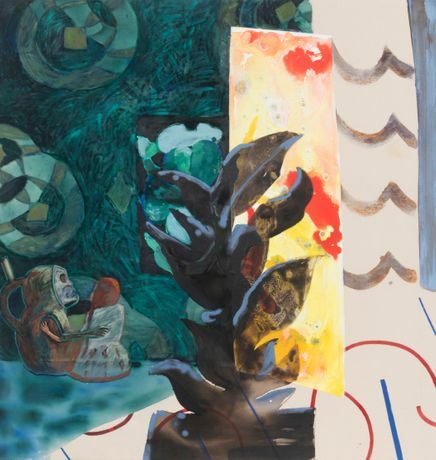 She has been the beneficiary of grants and fellowships including New York Foundation for the Arts, 2008 and 2015, Artadia, and Pollock-Krasner, and has attended residencies at MacDowell Colony, Skowhegan School of Painting and Sculpture, International Studio and Curatorial Program, and Chateau La Napoule. Gualdoni lives and works in New York City and is a founding member of Regina Rex, an artist-run exhibition space.